312 pages | 90 B/W Illus. 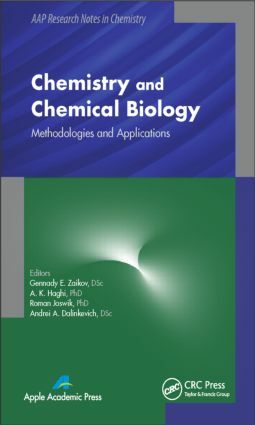 This important volume highlights the latest developments and trends in chemistry, biochemistry, and biology. It presents the developments of advanced materials and respective tools to characterize and predict the material properties and behavior. The book provides original, theoretical, and important experimental results that use non-routine methodologies often unfamiliar to the usual readers. The papers on novel applications of more familiar experimental techniques and analyses of chemical, biochemistry, and biological programs indicate the need for new experimental approaches. Gennady E. Zaikov, DSc, is head of the Polymer Division at the N. M. Emanuel Institute of Biochemical Physics, Russian Academy of Sciences, Moscow, Russia, and professor at Moscow State Academy of Fine Chemical Technology, Russia, as well as professor at Kazan National Research Technological University, Kazan, Russia. He is also a prolific author, researcher, and lecturer. He has received several awards for his work, including the Russian Federation Scholarship for Outstanding Scientists. He has been a member of many professional organizations and on the editorial boards of many international science journals. A. K. Haghi, PhD, holds a BSc in urban and environmental engineering from University of North Carolina (USA); a MSc in mechanical engineering from North Carolina A&T State University (USA); a DEA in applied mechanics, acoustics and materials from Université de Technologie de Compiègne (France); and a PhD in engineering sciences from Université de Franche-Comté (France). He is the author and editor of 65 books as well as 1000 published papers in various journals and conference proceedings. Dr. Haghi has received several grants, consulted for a number of major corporations, and is a frequent speaker to national and international audiences. Since 1983, he served as a professor at several universities. He is currently Editor-in-Chief of the International Journal of Chemoinformatics and Chemical Engineering and Polymers Research Journal and on the editorial boards of many international journals. He is also a member of the Canadian Research and Development Center of Sciences and Cultures (CRDCSC), Montreal, Quebec, Canada. Roman Joswik, PhD is director of the Military Institute of Chemistry and Radiometry in Warsaw, Poland. He is a specialist in the field of physical chemistry, chemical physics, radiochemistry, organic chemistry, and applied chemistry. He has published several hundred original scientific papers as well as reviews in the field of radiochemistry and applied chemistry. Andrei A. Dalinkevich, DSc, is head of the group at the Institute of Physical Chemistry at the Russian Academy of Sciences, Moscow, Russia. He is a specialist in the field of chemical kinetics, chemical physics, polymer materials sciences, and organic and inorganic fibers. He has published several original scientific papers as well as reviews in the field of degradation and stabilization of polymers and polymer materials.